Navigation vendors TomTom and Navigon this week announced significant updates to their respective turn-by-turn navigation apps for the iPhone. TomTom on Thursday revealed a major update to the company's $100 TomTom US & Canada. 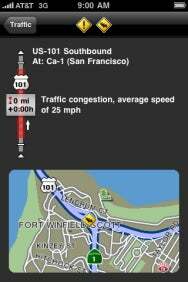 The new version adds a number of oft-requested features, first among them being text-to-speech directions, which allows the app to read aloud the names of places and streets, and an iPhone-app implementation of the company's Advanced Lane Guidance, which gives you detailed, 3-D images of complex intersections for easier navigation. Also included in the latest version are map and safety-camera updates; a new Help menu that provides direct access to emergency numbers and directions to emergency providers; in-app control of iPod playback; and customizable audio warnings for events such as exceeding the speed limit and approaching safety cameras. The free TomTom update has been submitted to Apple for approval. Meanwhile, Navigon has announced the availability of an update to the company's $90 MobileNavigator North America iPhone app. The new version includes several minor enhancements, including an extended-destination search that helps find a destination even if you don't have the full address, and the capability to manually move your destination pinpoint at any time. But the biggest new feature is the availability of Navigon's Traffic Live feature. Available as an in-app purchase, Traffic Live takes advantage of real-time traffic information—gathered from current Navigon iPhone users, commercial fleets, and other GPS systems, as well as data from ClearChannel’s Total Traffic Network—to determine the fastest route, update travel times, and warn of accidents, construction, and other incidents. For the first four weeks of release, the Traffic Live in-app purchase will carry a price tag of $20; the price will then increase to $25. There are no ongoing service charges for Traffic Live, although Navigon notes that if your iPhone service doesn't include a data plan—a possibility outside the U.S.—additional data charges may occur when using the Traffic Live feature.